I could make a meal out of beets. There is something so comforting about these delicate, silky rounds, drizzled with a bit of high-quality olive oil or a citrus vinaigrette. 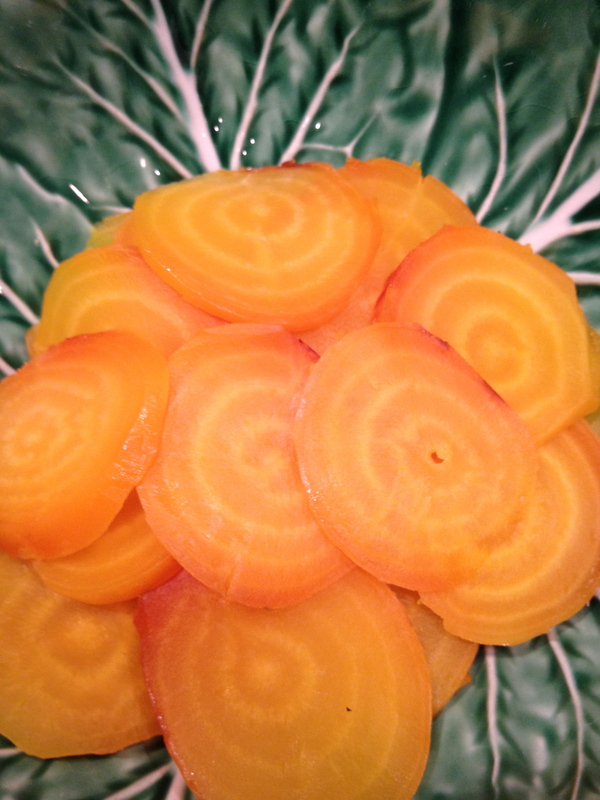 I usually rough chop my beets into bite-sized triangular shapes after roasting the whole beet in foil in the oven for 1-2 hours depending on the size, but to highlight this red pepper confetti, I sliced golden beets extra thin (patience was required in a mandoline’s absence), and tossed the bright, raw red pepper over the platter. To make the confetti, slice a red pepper lengthwise into four parts. With the skin side touching the cutting board, tip your knife almost parallel to the pepper and scrape out the seeds and the white-ish skin. The inside of the pepper should be bright red and slightly juicy after removing the top layer of flesh. Then slice each piece lengthwise into 1/8 inch wide strips. Dice the strips evenly into tiny pieces, as seen above. Wrap the confetti in a dry paper towel to extract any juice or water from the pepper. After a few minutes, the pepper confetti should be dry. Toss them over anything and everything for added flair and a pop of color. I try not to skimp on creativity and excitement when cooking for one. It is admittedly more of a challenge and not usually as much fun as preparing a full meal for family, but I never find the need to dig into the take-out menu drawer. 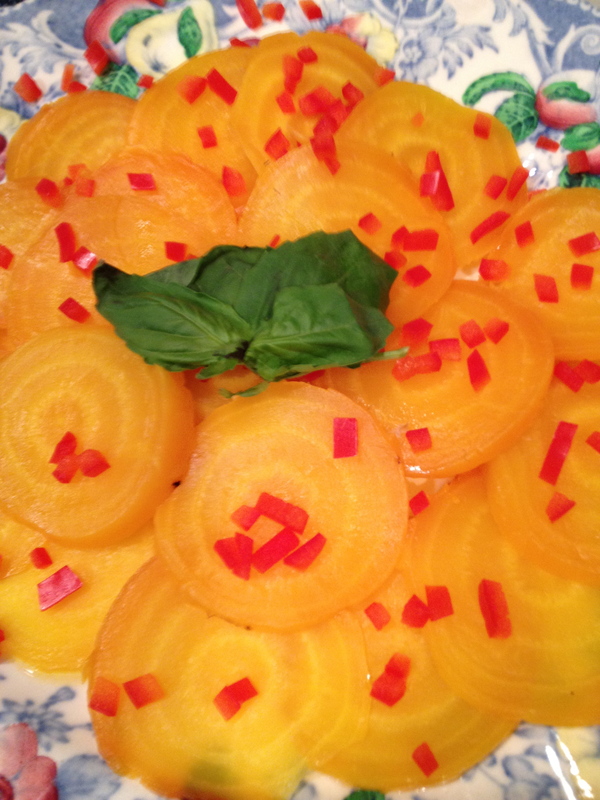 For this simple, light, colorful salad seen above, I made my sweet potato strips, saving a few for the next night, and roasted a few slices of eggplant and yellow pepper. At the end of the cooking process, I tossed a few cherry tomatoes on top of the roasting vegetables, just to give everything a bit more flavor. A little bit of chopped scallion, thinly sliced celery, more cherry tomatoes, and fresh arugula tossed in lemon juice, extra virgin olive oil, and a pinch of salt and pepper, and I have plenty to eat. I placed everything over a toasted pita, and voila, dinner for one. That looks really good. I’ve never seen a beet that wasn’t red before.